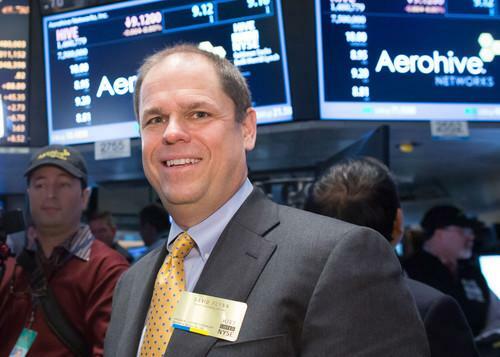 Aerohive Networks CEO and President David Flynn on the floor of the New York Stock Exchange on Friday as the company made its initial public offering. Aerohive Networks sells not just enterprise Wi-Fi gear but also cloud-based software designed to make it easier to set up and manage a customer's entire wired and wireless network. Other wireless LAN vendors are moving in the same direction, including Cisco Systems, the biggest seller of enterprise Wi-Fi, which acquired Meraki Networks in 2012. Aerohive went public on Friday, raising US$75 million to feed a business with fast-growing revenue but no profits yet. The stock hit its forecast price but didn't rise above it. Just after he rang the closing bell at the New York Stock Exchange, CEO and President David Flynn talked to IDG News Service about the challenges of Wi-Fi and the promise of future advancements. The following is an edited transcript. IDG News Service: Why do I need a cloud just to manage my Wi-Fi? Flynn: If you look at what is needed to deploy and have the full capability of an enterprise-class Wi-Fi infrastructure, there's a lot to it: how you onboard clients, how you handle users, how you hand out guest credentials. A lot of things to put together. Aerohive integrates that all in a unified cloud package to dramatically simplify the acquisition, deployment and ongoing operations of the wireless infrastructure. IDGNS: Is Wi-Fi fast enough now? Flynn: If you just have a client, and you have a good, fast client, and you want to use the Wi-Fi network with one client on it, it is more than fast enough for anything normal you would do. We have the 450Mbps radios on three-stream 802.11n, we now have gigabit radios on 802.11ac. But Wi-Fi's a hub. It's a shared medium, and so it's never really fast enough, because you have so many shared client devices on it. And we need it to get faster and faster, more capacity, more access points to handle the number of devices that are showing up on the network. The move to 802.11ac, gigabit Wi-Fi, is going to help with that. And then there's a move to Wave 2 gigabit Wi-Fi, the second wave of 802.11ac, that will start to make it look more like a switch, so you can have more parallel conversations. That's a huge leap forward for the industry. But there are so many mobile devices showing up that we don't see an end to the demand for Wi-Fi capacity. IDGNS: Do we need more spectrum opened up to Wi-Fi? Flynn: It would certainly help. Obviously, we're supportive of some of those initiatives. IDGNS: What would Aerohive do with that extra spectrum? Flynn: Mostly just bring it to our customers to give them more spectrum so they can handle more density of devices in their environment. One of the most dense verticals is education. Some of these schools are designing for 100 client devices per classroom. They're not there yet, but the ability to have more spectrum, to have less overlapping channels, would help to scale it to even higher capacity. IDGNS: How can Aerohive stay ahead of Cisco? Flynn: The key thing is that we have built the next-generation architecture that's the foundation that we can build upon. We've built an architecture that scales up and down: handles small business problems, large enterprise problems, with a very efficient, unified architecture. Cisco has gone and created three different competing architectures. IDGNS: Is the tech industry in a bubble? I think there are certain components of the tech industry that are in a bubble. But tech is very diverse. I was stunned by a $2 billion acquisition of a zero-revenue gaming company. Maybe there's a magic I don't understand, but there are definitely some places where you see a bit of a bubble. The space we are in, we are not in a bubble at all. We believe there's a lot of potential to grow and increase values of companies in this sector as the mobility revolution continues.